At PAX Prime this year I was lucky enough to get to demo Rain, a game coming to the PlayStation 3 this fall. I had some idea of what to expect going into the demo, as we’ve gotten to see both a gameplay video and a story trailer, as well as the trailer that was shown at E3. Rain is being developed by SCE Japan Studio, PlayStation C.A.M.P., and Acquire. It’s scheduled for release on PSN in North America on October 1st, and in Europe on October 2nd. Rain is an adventure game that tells the story of a little boy, who is searching for a mysterious girl in the city. 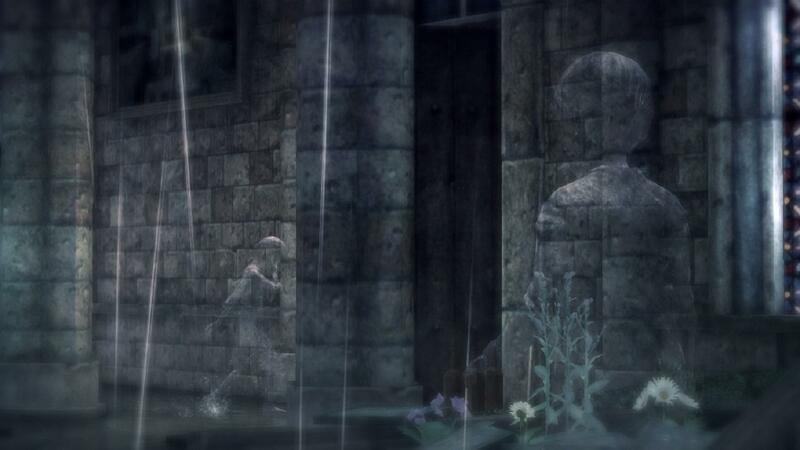 The catch is that both children are invisible and can be seen only when they stand in the rain, which gives us Rain’s main gameplay mechanic. As the little boy, you must stand in the rain to make yourself visible, but this means you’re visible to everything else around you as well. As a result, you must also take shelter from the rain to become invisible, during which you can only determine your location by the wet footprints on the ground or the puddles which you may step in. The demo took me about 15 minutes, and was essentially an extended version of the gameplay video that was released a few months ago. In the demo, you must make your way through the abandoned streets of the city at night to find and save the little girl, who is being chased by a mysterious entity. It quickly becomes clear that there are other invisible creatures roaming the night other than the ones chasing the girl, and they serve as one of your main obstacles. 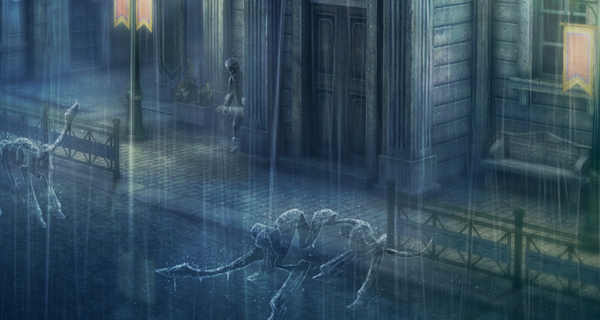 The enemies encountered in the demo took the form of dog-like four-legged skeleton creatures. There doesn’t appear to be any combat in the game, which is unsurprising given the boy’s limited range of movements. He can walk, run, and jump, making him ill-equipped to face the enemies he encounters. This leaves you with two options: remain undetected or outrun your enemies. As mentioned, the way to remain undetected is to take shelter from the rain, as the falling rain exposes you. In most cases during the demo, there were a lot of overhangs or roofs available to provide the needed shelter. However, enemies also become invisible when they are sheltered. This means you must listen for the sounds of their movements or watch their wet footsteps on the dry pavement to figure out where they are. The other option is to outrun or escape from enemies. Shelter was not available in some portions of the demo, so I was forced to make a run for it. In another case, I had to climb on top of boxes and roofs in order to avoid my pursuers. Most sections of the game seemed to consist of “puzzle-solving”, wherein I had to use my environment to figure out how to make it past enemies and continue on my way. Towards the end of the demo, there was even a sequence where I was forced to use myself as bait to run a group of enemies into a wall to knock down an obstacle that was in my way. Although the gameplay mechanics are unique in a lot of ways, the thing that really drew me to Rain was the aesthetic. The dark city you explore is beautiful, and has been lovingly crafted with obvious attention to detail. The streets lit only by streetlights, combined with the relentless rain and a subtle piano soundtrack, creates a kind of gloomy, lonely beauty that’s hard not to appreciate. Although I had to play the game in the noisy expo hall, the music always fit when I had a chance to hear it, especially when Debussy’s “Clair de Lune” was playing. On top of all that, the game has an intriguing story. The demo opens with a cutscene (made up of a series of gorgeous watercolor-esque paintings) explaining that the boy was in bed with a fever. He saw the girl outside his window being chased by a huge monster, and when he slipped out he found that he was also invisible. In this way, the game sets up an interesting mystery. It drives you to want to chase after the girl to understand what’s going on. Why are they invisible? Why are they being pursued? Overall, I was intrigued by the demo for Rain, and I’ll definitely be getting it on PSN when it comes out in October. If you’re curious about the game, be sure to check out the trailer.